There are multiple ways to cut fat in your baked goods without compromising much on taste. I don't believe in enjoying healthy foods that TASTES healthy in the commercial sense; read as - bland, earthy, ....at times a complete blech. I scout for recipes that are nutritious without making the consumer feel like a nobody. I am more of instead of "10 tbsp of butter", use 5 tbsp and substitute something healthy and naturally low fat instead. Though a lot of options are readily available nowadays in the market to make such replacements, I tend to steer clear from a lot of them due to artificial ingredients. 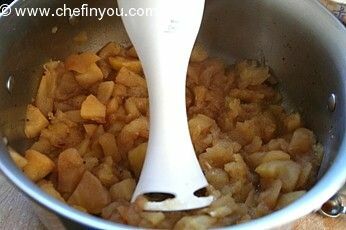 So when I found this recipe for Apple Butter that I could whip up right at home, in about 15-20 minutes, I was ecstatic. Apple Butter, homemade tastes much better than the store bought ones. 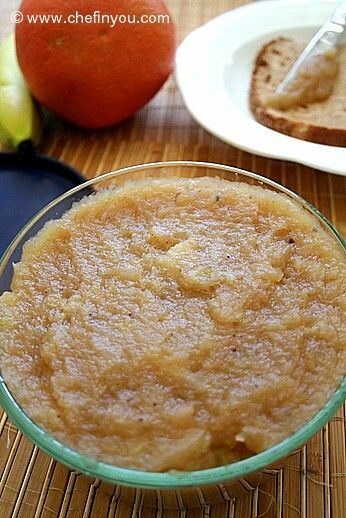 There are many recipes and variations for making apple butter with most of them relying on store bought apple sauce. 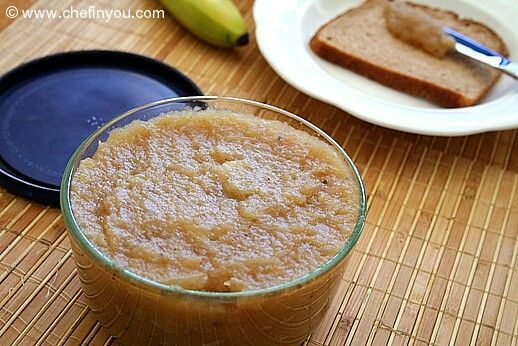 This recipe uses fresh apples and also uses a natural sweetener (if using) - Maple Syrup. Mildly spiced, these are a dream to have in your fridge. 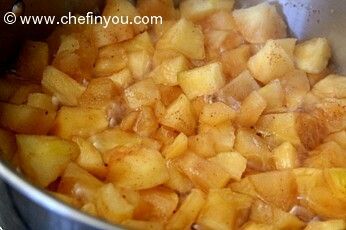 This recipes gives you a spiced and sweetened version of Apple Butter which you can skip so that you can use it in all your baked goods without the butter overpowering the taste. Note: To make Unsweetened Version for baked Goods simply omit the maple syrup/sugar and spices. I eyeballed my spices hence don't have measurements. You can use Pressure cooker, Stove top or microwave to make this. I don't normally use M/W for cooking and would have used pressure cooker. 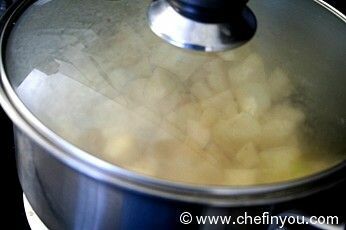 But to show you how it is made at every stage, I have used Stove top for today's post. But I would recommend pressure cooking since it traps flavors better than stove top and is more aromatic. 4. and bring it to a boil over medium high heat. 5. 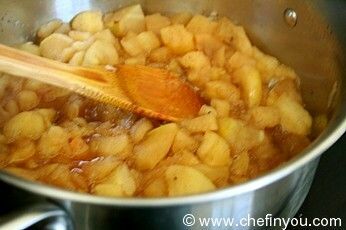 Reduce the heat to medium-low and simmer until the apples are soft enough to mash with the back of a wooden spoon - this takes approx 15-25 minutes, depending on the size and type of apples. 6. 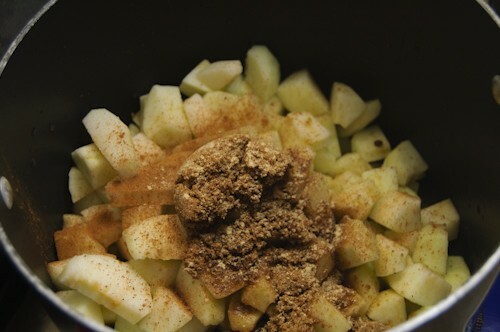 Remove the apple mixture from the heat and puree with an immersion blender. and not like an applesauce. And that's it. You can refrigerate this upto 2 weeks. Do not freeze. I usually make small quantities like this and use it all within 10-15 days. I combine all the ingredients , cook for 4-5 whistles and then blend it using my blender. More whistles than that, I find that my butter becomes watery. I think you would have to experiment with your pressure cooker to get the consistency I show before blending. Soft but not watery. I am just writing down the notes added by the original author of this recipe. For M/w, reduce the apple juice to 2 tbsp. Then place all the ingredients in a m/w bowl. Cover with plastic wrap or m/w resistant plate and cook full power for 8 minutes turning the bowl 180 degrees once halfway through. Check, and if apples are not soft enough to mash with the back of a wooden spoon, repeat for another 4 minutes. test again and repeat if necc. 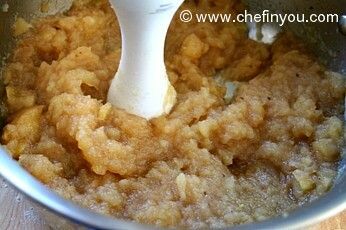 Puree as mentioned for stove top method. Second attempt at applebutter here. First time I mainly peeled the apples for my sister. This time, my daughter (13) and I did all the work. worked out pretty good, we think! 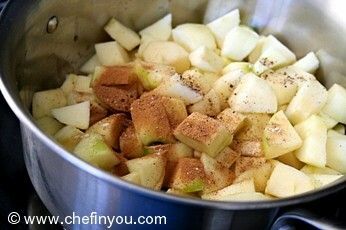 We simply peeled the apples, boiled them till soft, then put in food processor with sugar, cinnamon, cloves, nutmeg and a little all-spice (to suit taste). I love honey, so put a little of that in each batch as well. Mixed well, then put in prepared jars and water bath to seal. Now let’s see if I can do this apple jelly my sister told me about….. I just wrote a blog post about making this recipe. Super easy! Check it out HERE! Admiring the time and energy you put into your blog and in depth information you present. It's good to come across a blog every once in a while that isn't the same out of date rehashed material. Excellent read! I've saved your site and I'm adding your RSS feeds to my Google account. :? : Can this recipe be canned using the water bath method? I have made this receipe using a combination of ripe bartlet pears and jonathan gold apples. Wash the fruit well, do not peal or core. Cut into fourths or eighths and place in a large sauce pan. 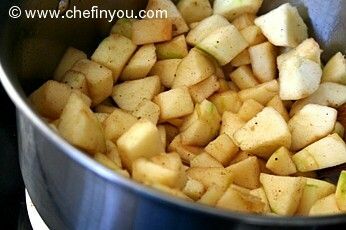 Add several cups of apple juice to help start the process. Simmer until mushy then run through a sieve. Put the sauce in a crock pot and simmer on low until the desired thickness is obtained. The sauce will take on a beautiful tan hue during the reducing process. I have added a small amounts of molasses and and/or apple cider vinegar to control the desired sweetness/tartness. Add the spices at the end of the reducing process. It's all a matter of taste. An all pear version is also delicious, maybe more so. No watery problem here and it freezes well. Oh, by the way, I use apple pie spices. I always wanted to make apple butter, but was confused with the numerous recipes online. Thanks for the simple and wonderful recipe. Could you also post some recipes where you have used this apple butter? I did however use honey instead of maple syrup. But it was only 1/2 a cup. Tried your recipe thanks. However, I excluded the apple juice as I've had problems with jams being too watery before. Mine was very runny even after several hours of cooking, plus the addition of cornflour and arrowroot. And I put a lot of corn flour in: http://www.thebreadcrumbtrail.org/gallery2/main.php?g2_itemId=24075 Any ideas what went wrong? I made this last thanksgiving and it was a huge success and everyone was begging for more. I have a write up on my blog (http://beccablogs.com/?p=785) and will be making it again this weekend to take to Passover sedar on Monday. Thanks for your clear directions! 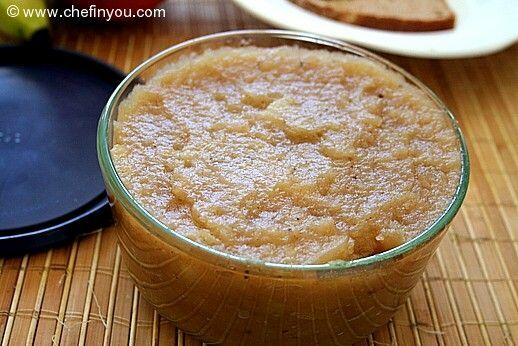 Applebutter is apple sauce that has been caramelized during the cooking process. How does this differ from applesauce? 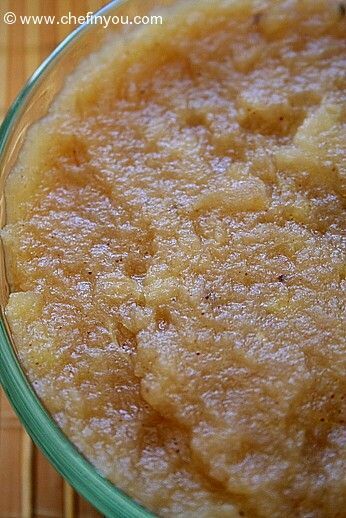 I wondering because I saw a similar recipe (if not the same) some time back for making homemade applesauce. HI...just a quick question...is there a diff between granny smith apples and grammy smith? we only get granny smith here..so was just wondering...recipes sounds too easy to pass..esp the pressure cooker method. Would it be possible to make this in a crockpot/slowcooker and could I use agave? This is truly a healthy alternative to the fatty butter. I would love to use this in my baking. Good one DK.